Pacific Crest health team coordinator Jim Olea teaches corps members how to use an automated external defibrillator. As Pacific Crest gathered the weekend of Feb. 15 for its monthly rehearsal camp in Diamond Bar, Calif., a small group of corps members spent time practicing skills they hope to never have to use. What might sound like a counterproductive way to spend a weekend that's designed for corps members to learn music and marching in preparation for their summer-long tour across the United States, was actually time well spent training students in CPR (cardiopulmonary resuscitation) and in the use of an automated external defibrillator (AED). The training session for corps members was led by Jim Olea, a Pacific Crest and Santa Clara Vanguard alum who currently serves as the corps' member health team coordinator. 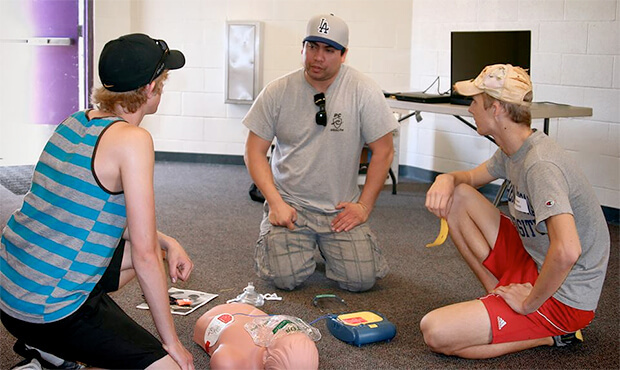 As a massage therapist currently working toward his degree in emergency medical services, Pacific Crest paid for Olea's CPR and AED certification through the American Heart Association so that he can train both corps and staff members. During the weekend, nine of Pacific Crest's student leaders spent three hours undergoing an intensive training, during which they were able to work with CPR manikins to practice skills and simulate emergency situations. In addition, the corps members worked with an AED, an electronic life-saving device that is used to assess, and if needed, to "shock" the heart into a regular pattern when an individual undergoes cardiac arrest. Pacific Crest joins a growing number of corps that have made the investment to keep an AED accessible at all times during their summer tours. Executive Director Stuart Pompel says that the purchase of the device, which can run upward of $1,500, was made possible thanks to a generous donation by a longtime Pacific Crest supporter who requested that the corps earmark a part of her donation for an AED. Different than a heart attack, the American Heart Association says that sudden cardiac arrest occurs when electrical impulses in the heart become rapid or chaotic which in turn causes the heart to suddenly stop beating. Though corps members are conditioned athletes, cardiac arrest can happen to anyone of any age at anytime. The Red Cross says that more than 350,000 cases are reported on an annual basis. "The drum corps experience is much more advanced then it has ever been," Olea explains. "Staff members are constantly asking the corps members to push their limits to achieve greatness and with that greatness can come consequences. When you mix elements of heat, fatigue and stress, you can cause your body to knock on the door of a cardiac arrest situation. That is why it is important to have members and staff trained and certified." The training and protocol the corps is putting in place for this coming summer will prepare them to take action in an emergency situation in the critical minutes between the time a situation occurs and when medical personnel arrive on the scene. "With the section leaders trained, they can start CPR and instruct another member of the section to get the AED, call 911 and get more help," Pompel said. Olea says the average "call-to-shock" time of first responders in a typical community is around nine minutes, and utilizing an AED within one minute of collapse raises the survival rate to 90 percent. The Red Cross notes that for each minute defibrillation is delayed, the chance of survival is reduced approximately 10 percent. "The AED will be with the drum majors at the front of the field during practices," Olea said. "That way everyone who is certified can easily locate and retrieve it if there is a cardiac arrest situation." On the day of a competition, the corps' medical staff will carry the AED to and from the field. While on the road the device will be within easy reach at the front of the corps' staff bus. The small group of Pacific Crest members who underwent the first-aid training in February are now certified through the American Heart Association's Heartsaver CPR and AED program which is good for two years. The corps will expand its network of trained individuals over Memorial Day weekend, when Olea will hold a second training session for instructional and support staff who will be traveling with the corps over the summer. Pacific Crest's Jim Olea serves as part of a national network of medical professionals together known as the Drum Corps Medical Project (DCMP), who volunteer their services to DCI's World and Open Class groups throughout the summer months. Organized in 2007, the DCMP focuses on several key areas including research, education, physical training, and an extensive recruitment effort to provide more medical resources for corps during their annual summer tour. The DCMP is actively recruiting allied healthcare professionals including physicians, nurse practitioners, physician assistants, nurses, athletic trainers, exercise physiologists, physical therapists, dentists, psychologists, paramedics/EMTs, nutritionists and pharmacists. Healthcare professionals can choose their desired level of participation such as providing phone triage to corps, being involved in research and educational activities, as well as providing on-site or in-office evaluation and medical management for an ill or injured member. Fill out this form to receive additional information about the DCMP and to get involved.